The most potent particles on the electromagnetic scale and the known universe. Only created by radioactive atoms and nuclear reactions. The hottest regions of the universe produce them. Formed by Supernovae, Pulsars, Neutron Stars, Black holes, and Gamma Ray Bursters. 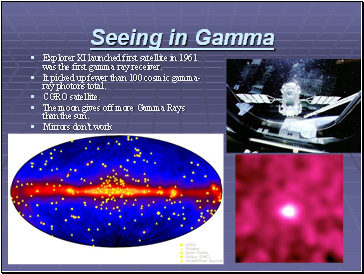 Explorer XI launched first satellite in 1961 was the first gamma ray receiver. 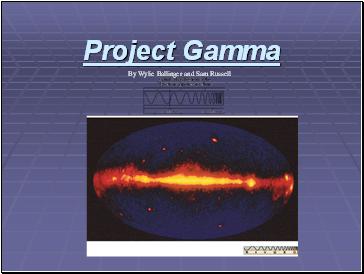 It picked up fewer than 100 cosmic gamma-ray photons total. 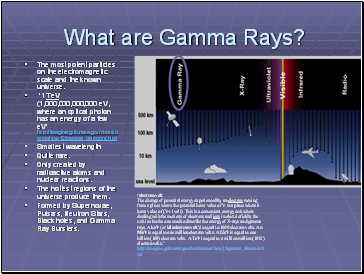 The moon gives off more Gamma Rays than the sun. 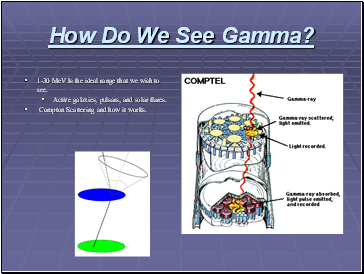 How Do We See Gamma? 1-30 MeV Is the ideal range that we wish to see. Active galaxies, pulsars, and solar flares. 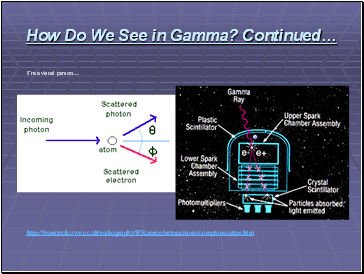 Compton Scattering and how it works. So How Does That Work Again? 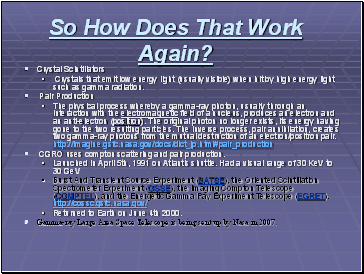 Crystals that emit low energy light (usually visible) when hit by high energy light such as gamma radiation.